HMCs Are Not Just for Big Manufacturing PG 12. Accuracy, Finish and Productivity Needs Drive Cutting-Tool Solutions PG 18. Guidelines for Advanced Hot Runner Manifold Channel Design PG 24. 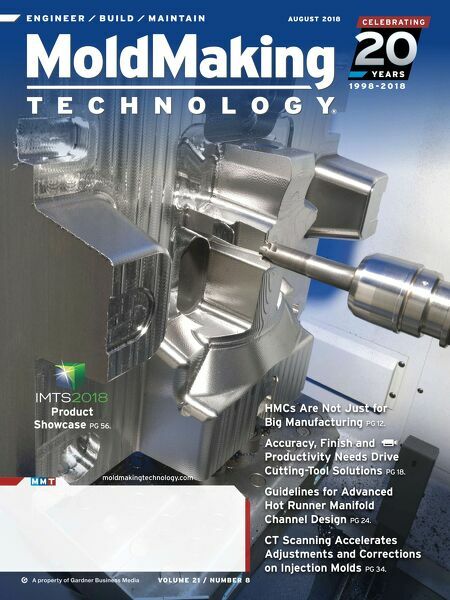 CT Scanning Accelerates Adjustments and Corrections on Injection Molds PG 34. VOLUME 21 / NUMBER 8 A property of Gardner Business Media AUGUST 2018 E N G I N E E R / B U I L D / M A I N TA I N Product Showcase PG 56.